Find occupational medicine specialists from numerous institutions in one organized, accurate, and human-verified database. 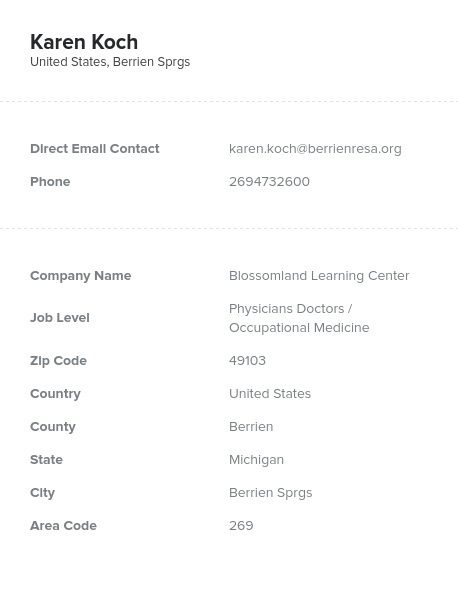 Bookyourdata.com has consolidated this vast group of occupational medicine specialists into one ready-made directory as an email list, which is ready for you to download now. Occupational medicine experts analyze and study different workplaces to try to prevent potential injuries, disabilities, and illnesses. Often advising government bodies, large corporations, and companies, this group ensures that employees have a safe place to work while preventing lawsuits. They study everything from ergonomics to epidemiology to toxicology to try to help their clients and patients. If you have a product that will help ensure the overall safety and sustainability of the work environment, whether that be a new ergonomic chair, an air filtration system, or a recommended keyboard, market to this uniquely qualified group of OM specialists, who can then recommend the product to their clients. This marketing strategy may be the best way to boost sales for your workplace product, especially if it emphasizes safety practices! This downloadable database full of highly sought-after contacts within the world of occupational medicine is affordable and available for you to download right away. We guarantee that our data will be accurate, as it's backed by our bounce-back guarantee. At Bookyourdata.com, we believe you should be able to reach the people most likely to be interested in your product. Connect with a group that's actively trying to make workplaces safer and smarter today!